With some trepidation I asked them what their cruise was like. "Brilliant. We had a fantastic time, you'll love it." This was music to my ears. David is a rusted on independent traveller. Coaxing him to visit any place where he can't easily hire a car and follow his own itinerary takes a herculean effort. 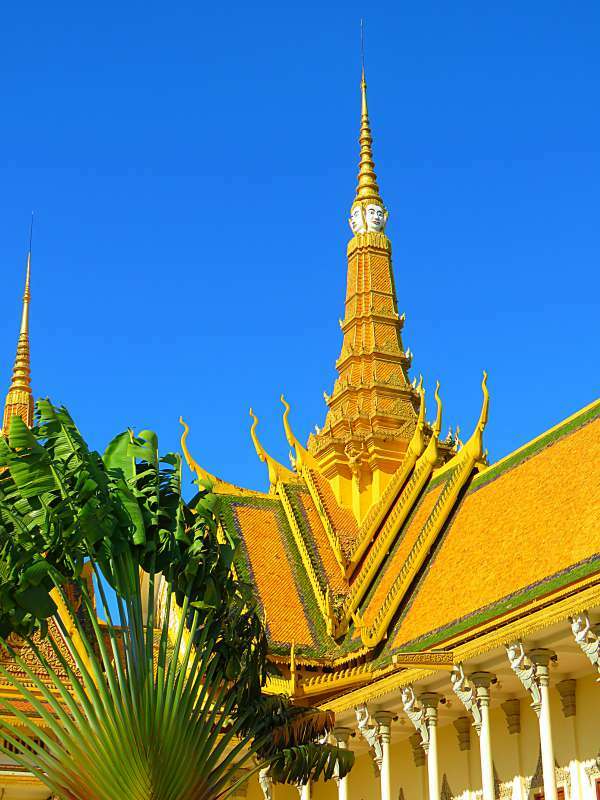 I have wanted to visit Vietnam and Cambodia for ever. So when he offered to go on a European river cruise - like driving really, only on water and someone else would do all the hard work - I jumped at the chance to persuade him to cruise the Mekong River instead. We locked everything in a year in advance (See my tip below about booking early). Guide books were perused, travel blogs read, hotels booked, visas obtained and flights organised. Then six weeks before we were due to depart disaster struck - I got sick, and almost derailed the whole thing. It turns out I have a heart condition. With less than two weeks to go it was a toss up between packing or cancelling. Christmas and New Year were looming, making medical appointments nearly impossible to schedule and without the go-ahead from my doctor we would be uninsured, to say nothing of the possibility I might have a stroke in Asia. It was too big a risk. At almost the last possible moment, literally days from cancelling, we got the green light from my doctor, delivered with a warning about staying hydrated in the heat. We also managed to organise pre-existing condition travel insurance, which is not nearly as easy as it sounds and couldn't be done until all the medical tests were completed. By then I had a lot invested in this trip and it was going to be hugely disappointing if it didn't go well. I needn't have worried. Scenic Spirit is stunning. It fulfills its promise of five-star luxury and then some. Boarding Scenic Spirit on Day 1! 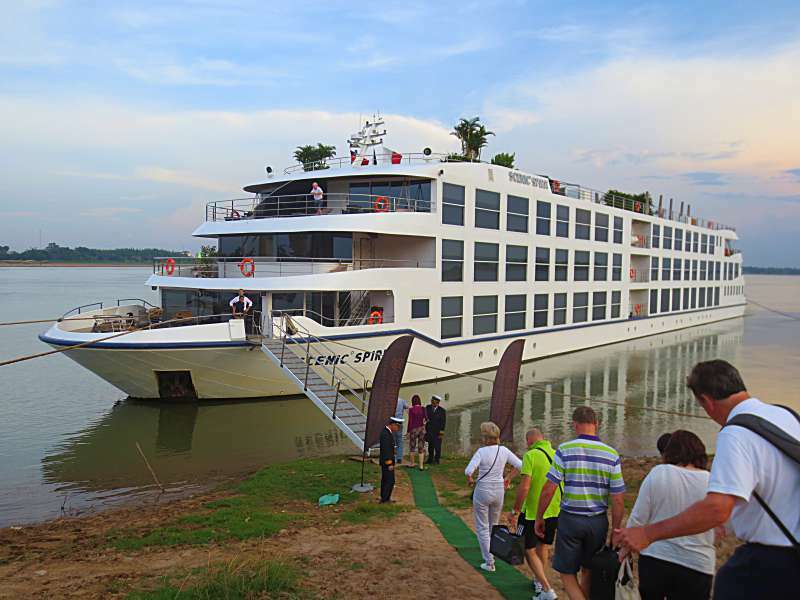 Purpose built for cruising the Mekong, Scenic Spirit sailed its maiden voyage in January 2016. 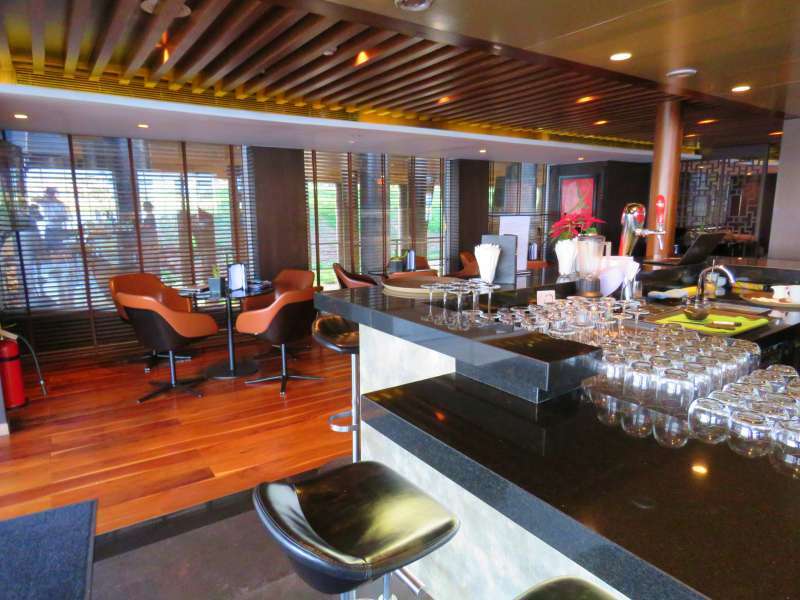 It carries a maximum of 68 passengers (there were slightly less on our cruise), has 34 suites, 4 decks (3 of which have passenger suites), 56 crew, a restaurant, cafe, bar, swimming pool, wellness centre, sauna, gym, library, laundry and elevator. Don't forget the elevator! Our cruise director was inordinately proud of the elevator and, for someone with a recently diagnosed heart condition, I have to say, it was very useful. Scenic Spirit's decks are named after jewels. Diamond, Sapphire, Jewel and Gem Decks, with an open Sun Deck at the top. Diamond Deck is the highest below Sun Deck, and Gem Deck is the lowest. 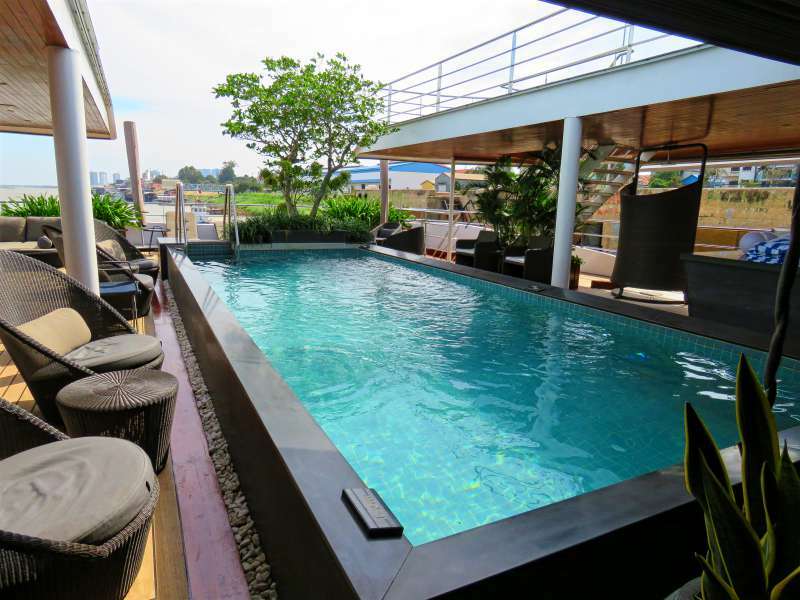 At the front of the ship, on Diamond Deck, there are two 80 m²/861ft² Royal Panorama Suites. 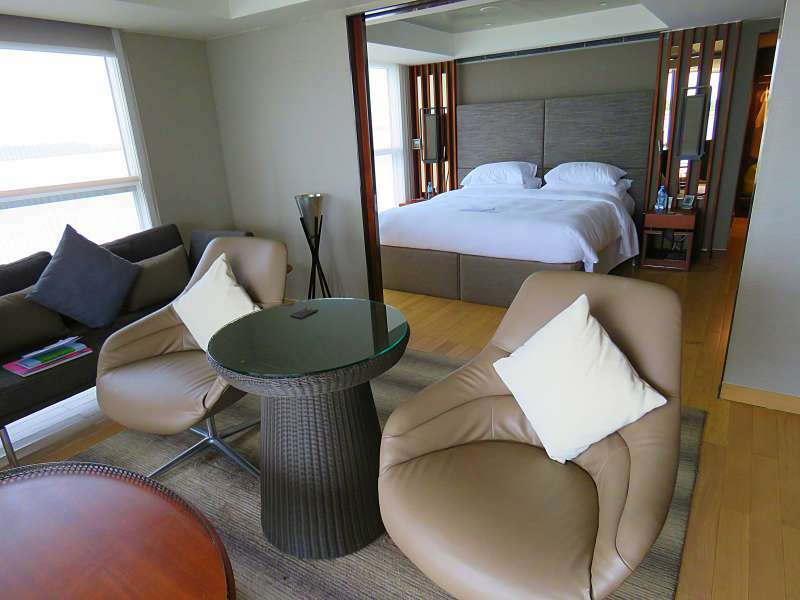 They are the largest suites on the Mekong and come with a separate lounge area, walk-in dressing room, full sized bathtub with a view and, best of all, a private, forward facing outdoor terrace complete with its own Jacuzzi. We had the Royal Panorama Suite on the starboard side. David, who is good at this kind of thing, was convinced the ship would sail closer to the starboard bank of the river - something to do with marine navigation rules. I wouldn't be able to tell you the starboard side of a boat from its port side if my life depended on it, so I just went along with his choice - as you do! On the second day of the cruise we met a Canadian couple who were in the port side Royal Panorama Suite. In the very best of humour they accused us of stealing their cabin. They tried to reserve the starboard side but were pipped at the post by us. As it turned out, David was right, the ship did sail closer to the starboard bank! In case, like me, you are a nautical novice, the starboard side of a boat is the right-hand side when facing forward. The port is the left. My tip:- If you want the best, or even the second best, suite on Scenic Spirit, book early. The more expensive suites fill up first. The terrace in our Royal Panorama Suite. You can see what a great view we had. Our Royal Panorama Suite. The round table belongs on the terrace. David and I brought it inside. It was perfect for room service dinners. 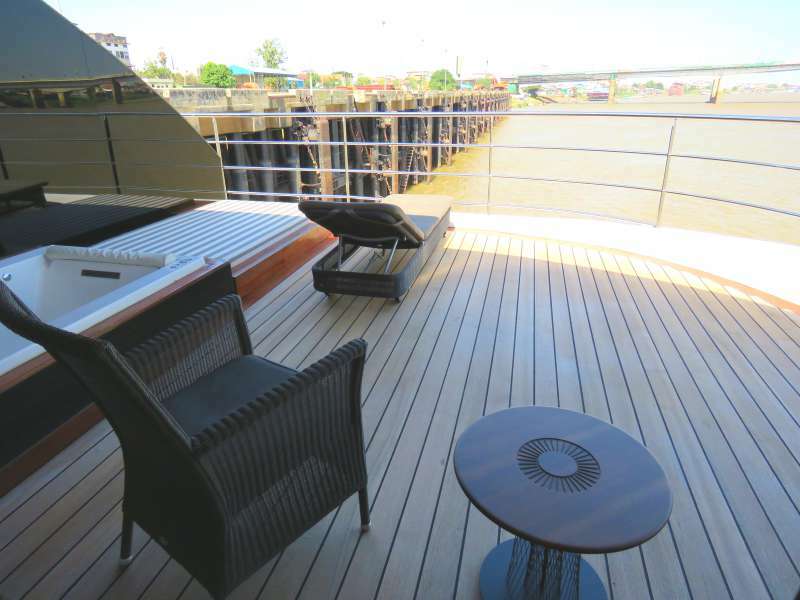 Also on Diamond Deck, Scenic Spirit has eight 40m²/430ft² Grand Deluxe Suites. Like the Royal Panorama Suites all eight were occupied. If you want one - book early! 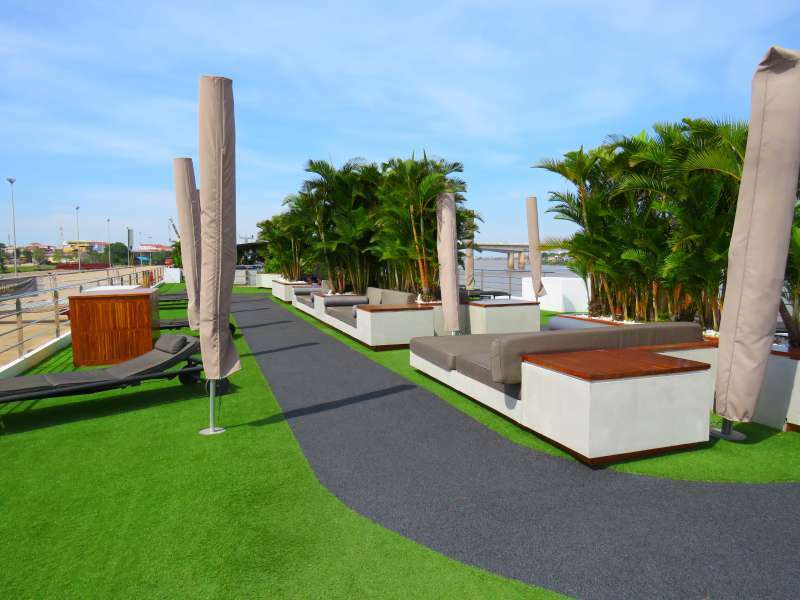 The 32m²/344ft² Deluxe Suites are on Jewel and Sapphire Decks with two at the back on Diamond Deck. A few were unoccupied so I was able to get a quick peek inside one. It was lovely. I wouldn't have traded it for our Royal Panorama Suite, mainly because of our terrace, but it was still very comfortable looking five-star luxury. My tip:- If you love to socialise and want to hang about the pool, bar, lounges or sundeck go for a Deluxe or Grand Deluxe Suite. There is no point in paying for a Royal Panorama Suite unless you plan to spend a fair bit of time in your cabin. David and I are natural hermits, most comfortable with our own company. For us the Royal Panorama Suite was a perfect fit. 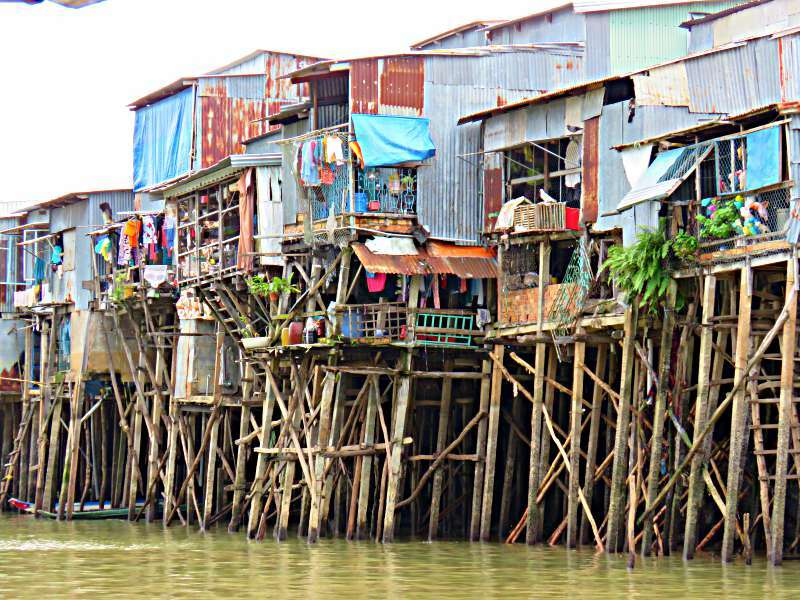 Life on the Mekong River. The swimming pool was stunning, particularly with the lights on at night. I would love to tell you I swam in it. I packed my swimmers specially so I could but somehow I just didn't get around to it. Maybe it looked a bit too perfect to disturb. When we wanted to socialise there was no shortage of places to eat, drink, relax and otherwise hang out with our fellow passengers. I confess though that I found it hard to tear myself away from our terrace. Watching the rhythms of life along the river banks was endlessly fascinating. 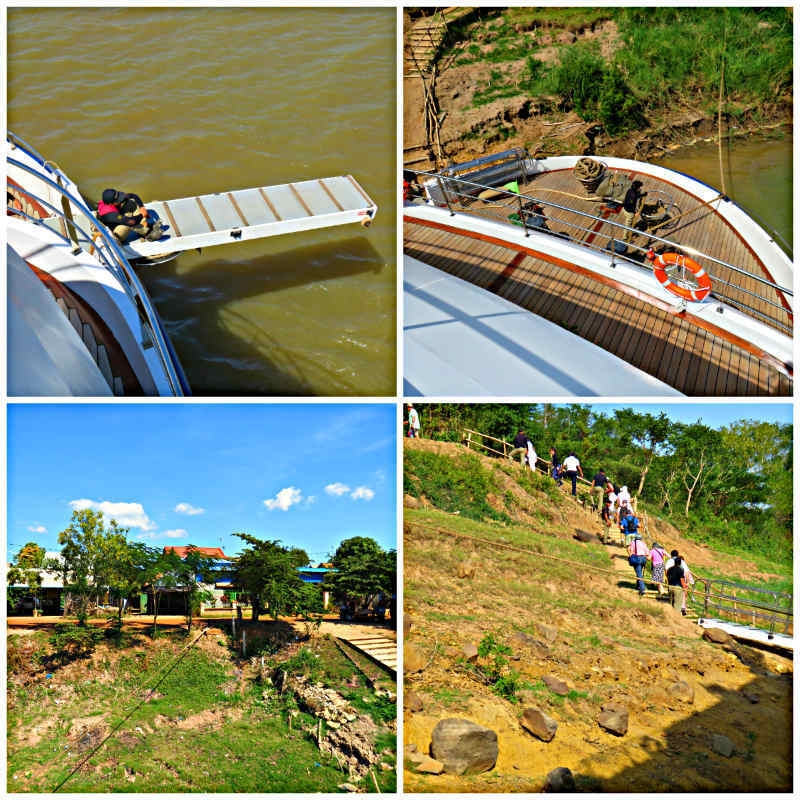 Scenic Spirit's Luxury Mekong River Cruise travels from Kampong Cham in Cambodia to My Tho in Vietnam. If you have never heard of either of these, don't panic! 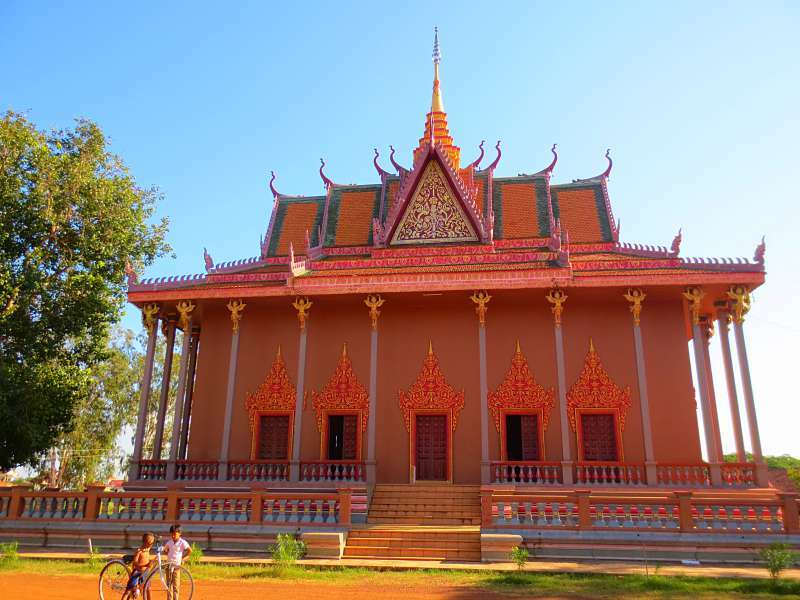 Kampong Cham is four and a half hour's drive from Siem Reap, where Angkor Watt is, and My Tho is one hour and twenty minutes from Ho Chi Minh City (Saigon). 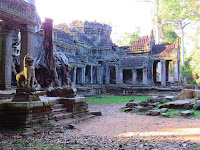 Scenic's staff met us at Siem Reap and left us at Ho Chi Minh City. Scenic Spirit sails the Mekong River in both directions so passengers either travel from Siem Reap to Ho Chi Minh City, as we did, or the other way around depending on the date of their cruise. The cruise lasts seven nights and eight days, however we boarded the ship late (around 4.30 pm) on the first day and disembarked early on the last day so there are only six full days aboard. The only disappointing day was the first. A note arrived at our hotel in Siem Reap the day before the cruise telling us to be at the meeting point at the Hyatt Hotel by 8.30 a.m to deposit our luggage and undergo passport formalities. These formalities took all of five minutes then we were told we had 'free time' until 10.20 a.m. We had just spent three days in Siem Reap and had absolutely no need of 'free time'. It was too hot and humid to enjoy a walk so we sat around the hotel lounge for a couple of hours. Combined with the bus trip to the ship it made the first day long and tiring. My tip:- Try not to get too disheartened by the first day. By Day 2 it will be a distant memory. Most mornings and afternoons saw excursions leave the ship to explore temples, villages, markets or other sights. Our first excursion was to the Buddhist temple at Wat Hanchey. Click on the link to read it. I will add links to each excursion as I write them up. I defy you to ever eat basa again after reading about our excursion to a Vietnamese fish farm - The confronting secret of Vietnamese fish farms. My tip - Don't feel compelled to join every excursion. With an excursion most mornings and afternoons, sometimes lasting as long as four or more hours, trying to do everything would be exhausting. We saw many beautiful pagodas. This one at Koh Chen, a small village in Cambodia where we did a walking tour, was my favourite. 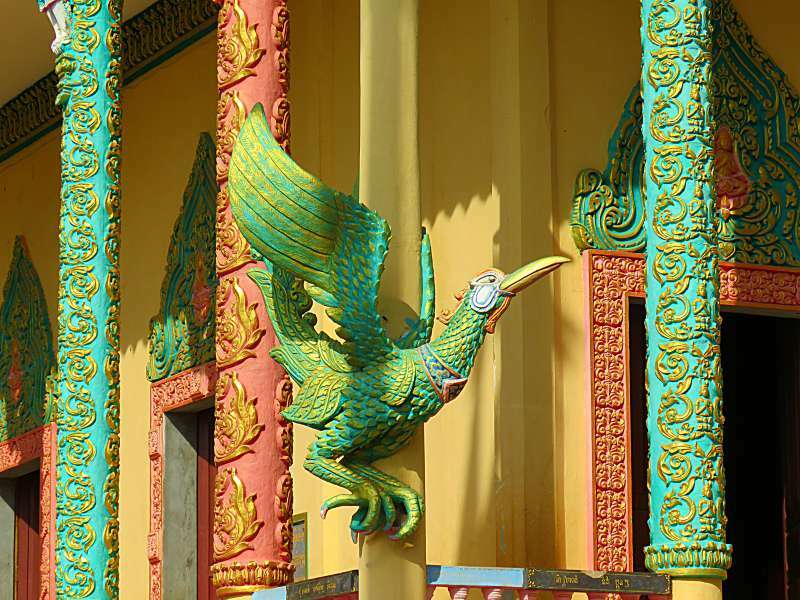 Garuda guarding Wat Hanchey, Cambodia. 'Wat' means temple. Watching the sun rise over Phnom Penh as the city came to life. Exploring as many villages and towns as we could, soaking up the feel of people's lives. 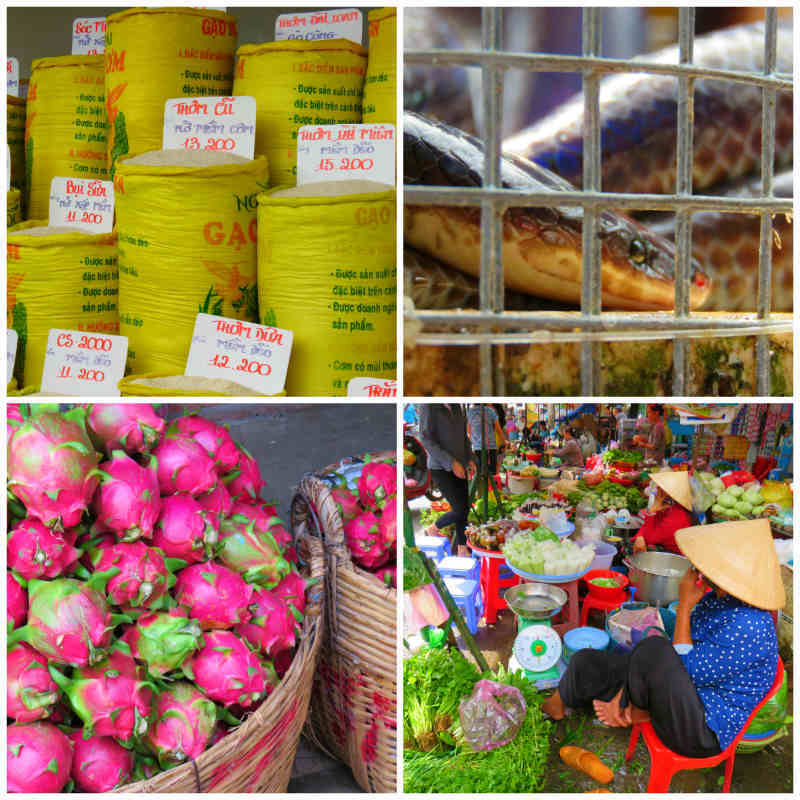 Exotic and colourful food at Sa Dec market in Vietnam. Spending hours watching the river banks glide by from the private world of our deck. 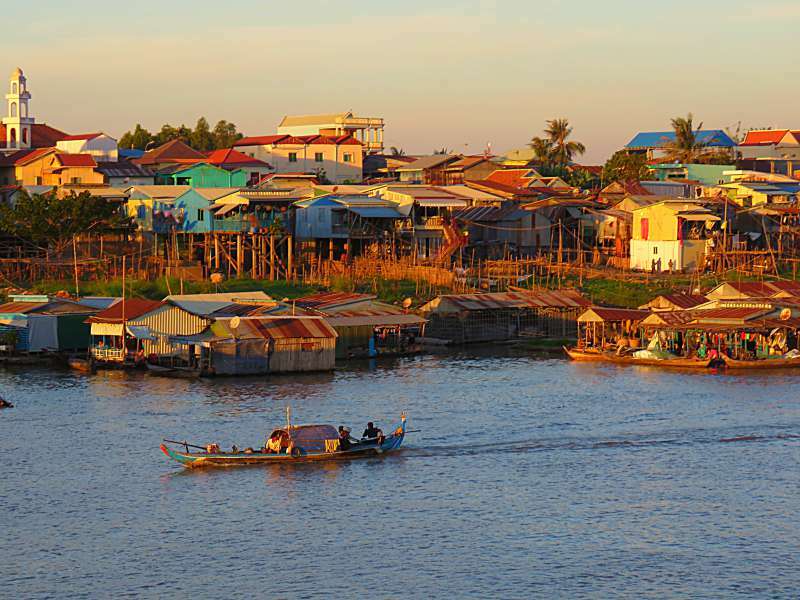 Whether it was fishermen casting their nets, families in floating houses or other river boats passing us by, there was always something to see. Visiting temples and pagodas - I never got tired of them. Watching the crew dock the ship every time we came into port. The port facilities generally consisted of nothing more than a tree or pylon to tie up to. Several of the crew would leap from the ship's deck to the river bank and once on land catch a weighted rope thrown by their shipmates. It didn't look easy and I don't think they ever succeeded on the first try. The weighted rope was then used to pull in a heavier mooring rope. State of the art port facilities! You can image what fun it was watching the ship dock. Note: David and I received a 10% media discount on the cost of our cruise. You can find more information on Scenic Cruises at Scenic.com.au. I look forward to read your blog posts. I wouldn't mind visiting China and cruising might be a great way to do it. I am more or less okay now. I just have to take every heart drug known to man for the next little while - lol! I know you love cruising. David originally offered me a European Cruise but I am so glad we went with Asia. It was a chance to see places we would never go on our own. I have never really considered a cruise before, but this one looks great for a solo traveller. Vietnam and Cambodia are definitely on my list of must sees. I look forward to reading more about your trip. I get very, very sea sick so cruising the ocean is not an option for me but river cruising was magical. I can't wait to go on another one. Never been on a river cruise before. I totally agree with the choice of rooms depending upon our interests. No point of spending so much when you are there hardly to sleep! The only problem with our Royal Panorama Suite was that it was so stunning we hardly made use of the rest of the ship. If you are someone who likes to socialise it is probably not the best choice of cabin. I was still quite weak at the beginning of the trip and nervous I would get sick again. It was easy to relax on the ship and in the first few days when it was hot and humid we watched the view from the air-conditioned cabin. There were floor to ceiling glass doors and huge windows so it wasn't much of a compromise. As we sailed south the weather settled down and became much cooler. My favourite part of the cruise was watching life unfold on the river as we passed by. It was magical. I left Siem Reap yesterday and am now in Phnom Pen! Wish I had done this cruise. It looks beautiful and the cruise looks relaxing. I'm enjoying Cambodia, so maybe I come back again and try it next time! We really enjoyed Phnom Penh. We had two days there. It has so much charm and Cambodians are such lovely people. Hope you are doing much better now. I have an idea of how it feels when everything points towards a trip cancellation and you are torn between what you want to do and what you have to do. Several years ago my grandmother passed away 4 days before a trip to Brazil. I decided to fly with my family and return the day before the plane was schedule to depart. Nowadays, we are hearing and reading a lot about river cruises. I am glad your were able to experience something different (not in Europe). I want to read more of your experience for sure! I was never tempted by Europe. We can travel in most European countries independently but there was no way I was getting David to risk the hassles of Asia any other way. 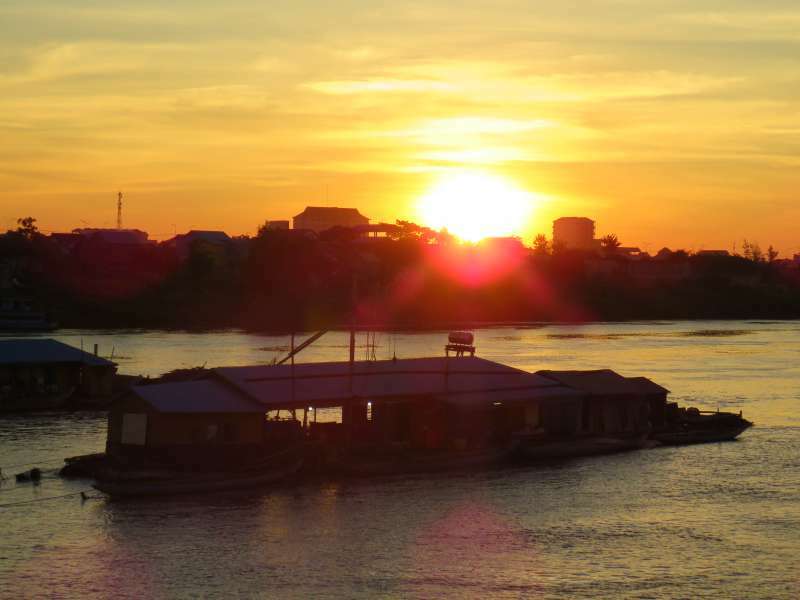 I never knew that I wanted to go on a Mekong River Cruise until now. This looks fantastic. And I'm so glad you were able to make it work. Haha - I know what you mean about not knowing you want to do something until you read about it. It is one of the perils of reading travel blogs. I keep find new places I want to see. I hope you're doing well and managing your condition Lyn. I'm so glad it didn't derail your plans. 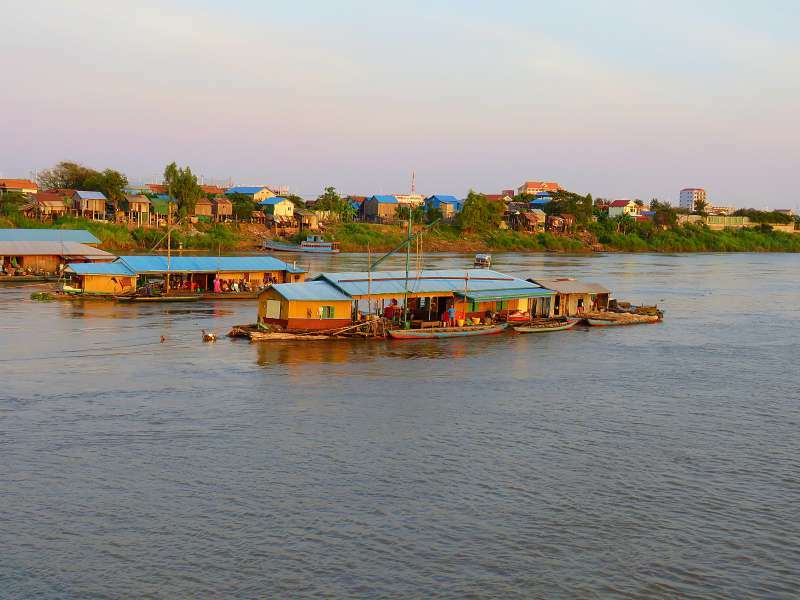 A Mekong River Cruise with Scenic Spirit is something I'd love to do, and your tips are so helpful too. I seem to be okay now so fingers crossed. I hope you get to cruise down the Mekong one day. It was great. 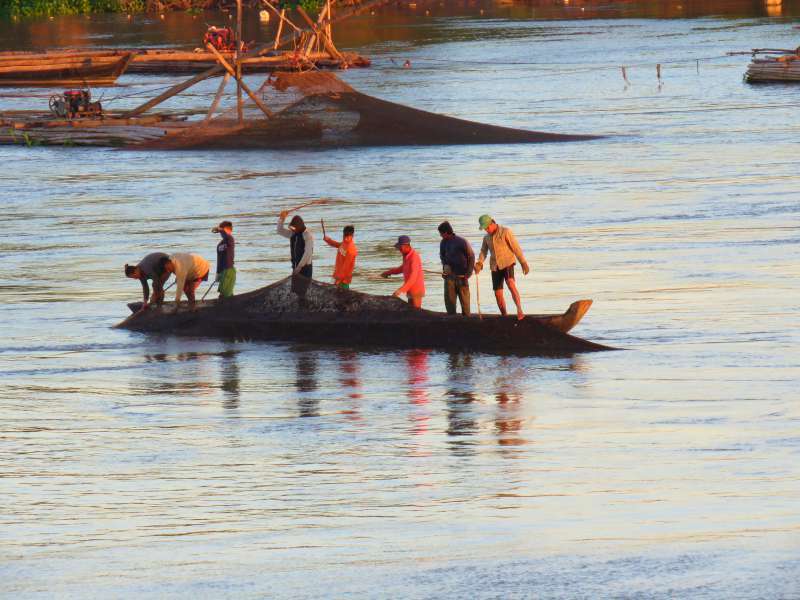 Cruising the Mekong River looks to be quite enjoyable. I especially like the images of the color-soaked houses. And I always enjoy visiting a temple. My photos of the houses were taken in the early mornings and evenings. It made their colours stand out beautifully. It was simply wonderful. What more can I say. I was very happy to see your post. 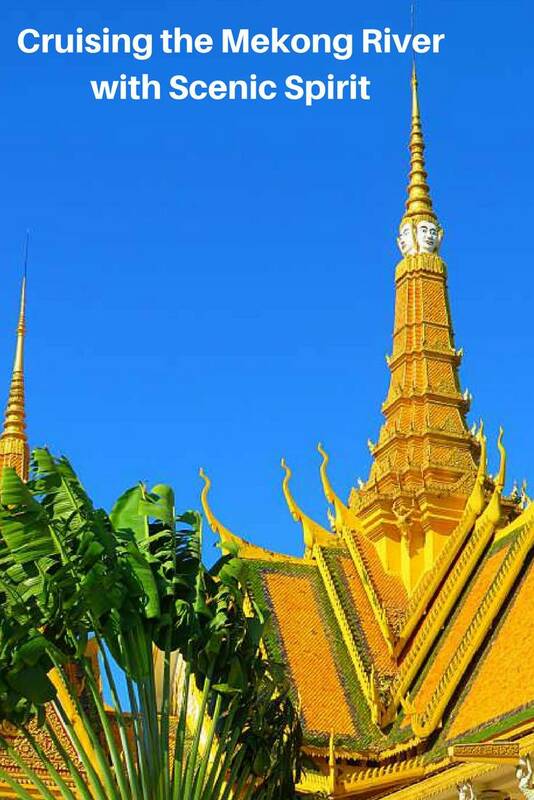 We are booked on the Mekong River cruise next year and you just increased my level of excitement! Glad to hear your health concerns are being managed. I hope you enjoy the Mekong as much as we did. Lyn I was very sorry to read about your heart condition. It must have been so stressful not knowing if you would be able to make the trip until the last moment. Having the suite you did sounds perfect for your situation and for how you and David like to travel.It is interesting to see your photos since we have been in the same area so recently. We had a couple of boar excursions in Cambodia and Vietnam but these were in rustic long boats. Happy to hear you had a wonderful time and would recommend a river cruise. I have been following your travels, as you know, with interest. It is fun following on with someone who is travelling in the same part of the world but in a completely different way. I couldn't have done your cycling trip even if I had wanted to but I am glad you seem to have had a ball. We are booked for March 2019, after reading your blog we know we made the correct choice, we are SO looking forward to it. I look forward to following along with you. I am sure you will have a great time. I have recovered to the point where my condition just needs to be managed. I probably took it a bit more carefully on the cruise than I would have had I not been sick but apart from that it didn't really impact us at all. It is easy to go carefully when you are in the lap of luxury all day with the view just floating by. I have been on a number of ocean cruises but your suite puts the ones I've seen on larger ships to shame. I think it's time to check out the river cruise scene. I was thinking about a cruise on the Irrawady River last year but I think I'll wait and see your Mekong cruise posts first. Ocean cruising is not an option for me - I get hideously sea-sick but I did love the river cruise. Feel free to give me a ring or send me an email if you want to talk about cruising with Scenic. 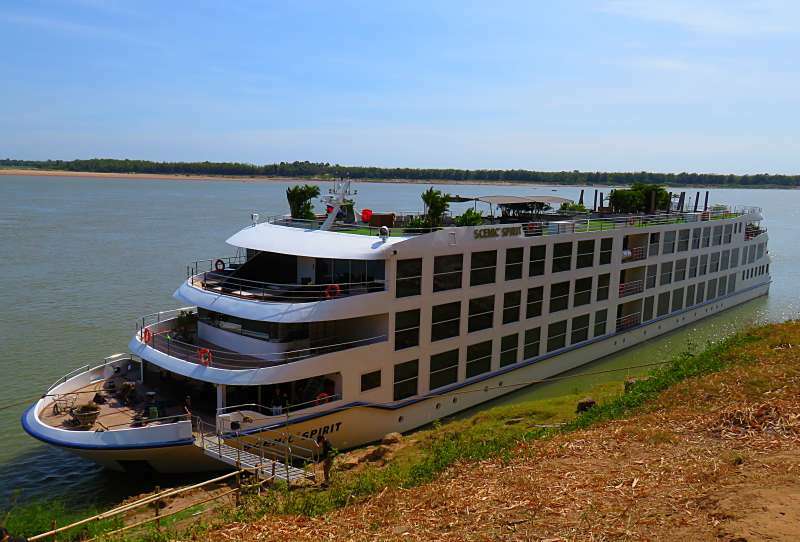 They do an Irrawady cruise as well as the Mekong one. I have heard Laos is great though we have never been there - yet! We loved Cambodia. The people are so nice and it is so interesting. Small ship cruising is very different to those huge ocean liners with thousands of people on them. A floating city like them would drive hubby, and by extension me, nuts!